Clusium (Greek: Κλύσιον, Klýsion, or Κλούσιον, Kloúsion; Umbrian: Camars) was an ancient city in Italy, one of several found at the site. The current municipality of Chiusi (Tuscany) partly overlaps this Roman walled city. The Roman city remodeled an earlier Etruscan city, Clevsin, found in the territory of a prehistoric culture, possibly also Etruscan or proto-Etruscan. The site is located in northern central Italy on the west side of the Apennines. Chiusi is situated on a hill above the valley of the Clanis river near lake Clusium, both of which features had those names in antiquity. The Clanis is part of the Tiber drainage system and was navigable by boat from there. Rome was also accessed by the via Cassia, which was built over an Etruscan road. By the time it appears in Livy's History, it is already a major Etruscan city being petitioned for assistance against the republican partisans of ancient Rome. About its life prior to that time, Livy only makes a brief statement that it was once called Camars. 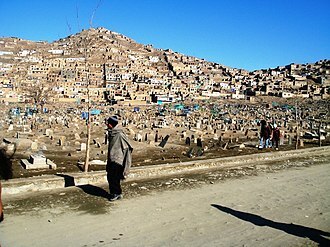 Different theories exist of the city's origin. 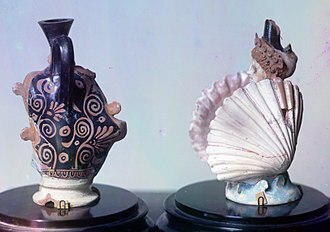 Villanovan pottery has been found at Chiusi. One common type is a cinerary urn dating to the 8th century BC. These urns are in the shape of wattle-and-daub huts with thatched roofs, presumably the homes of the deceased. This style of architecture is so different from classical Etruscan that many Etruscologists have denied a continuity. On the other hand, it is clear that the people of the region received a strong impetus from Greek colonies such as Cumae and from Greek immigration. The minority theory is currently the Proto-Italic. In this theory, Etruscans from the coast or from the Aegean resettled and renamed an Umbrian city called Camars, which the exponents believe means "marshland" in Italic. On enclosing the city with a wall they changed the name to "enclosure", using an Etruscanized form, Clevsin, of the perfect passive participle, clusus, of Latin cludere, "to close". Clevsin and Camars are more comfortable in their Etruscan milieu as Etruscan words. The limited known Etruscan vocabulary includes camthi, the name of a magistracy, which might be segmented cam-thi, where –thi is a known locative ending. Ar, -arasi, -aras are plural endings of different cases. A cleva is an offering. S and -isi are genitive and dative endings. A place of magistracies or offerings is entirely harmonious with Etruscan culture and the uses of a regional capital city. The final resolution of the question waits for more evidence. It is believed that Clusium joined the Etruscan League of twelve cities in the 600s BC. The site of ancient Clusium was reoccupied in Roman and later times, obscuring and obliterating much of the Etruscan layers. For example, the ancient sources describe the tomb of Lars Porsena at Clusium as well as the sacking and levelling of the city by Sulla. Much of what remains are its tombs and its underground passages, some of which might have been associated with the monument to Porsena. 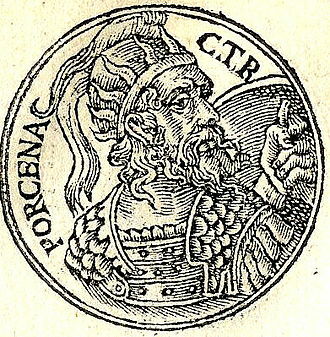 Lars Porsena was king of Clusium in 508 BC. 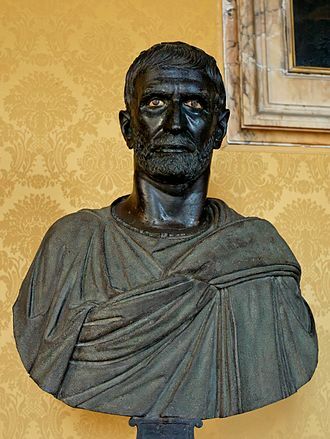 Lucius Tarquinius Superbus, formerly king of Rome, had been expelled along with his family from Rome in 509 BC. He had sought to regain the throne, firstly by the Tarquinian conspiracy and secondly by force of arms. 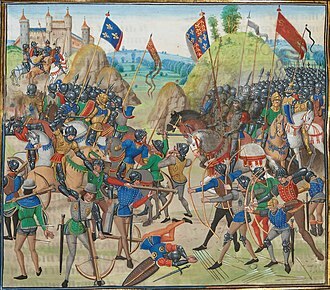 Both attempts had been unsuccessful, the conspiracy having been discovered, and Tarquin's army having been defeated at the Battle of Silva Arsia. Tarquin convinced Lars Porsena to lead his army against Rome. The war between Clusium and Rome followed, during which Porsena besieged Rome. The siege and the war ended with a peace treaty, by which Porsena received hostages from Rome and returned to Veii lands that had previously been taken by Rome. In 507 BC Rome's hostages and lands were restored, and peace between Rome and Porsena was cemented. Tarquinius was not restored to the Roman throne. Pliny the Elder wrote that a magnificent tomb was built for Porsena; a large mausoleum surrounded by cascades of pyramids over a labyrinth of underground chambers in which an intruder could get lost. Pliny never saw this tomb, so his description was based on a report from Varro and perhaps a conflated comparison to the Minoan labyrinths he describes before this tomb. 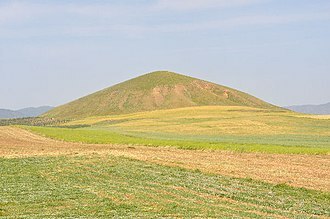 Large-size tumuli of the late archaic period were built at Chiusi, and modern scholars have tried to associate these (especially Poggio Gaiella) with the legendary tomb of Porsena. 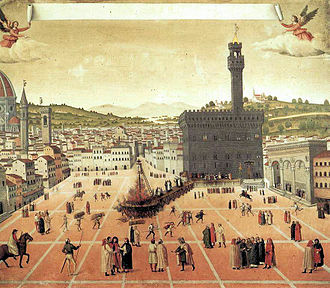 In 2004 Professor of Urban Restoration Giuseppe Centauro suggested that the traditional location of Clusium at Chiusi is wrong and that it is near Florence. 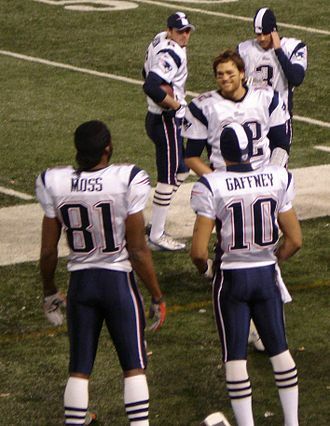 As of 2008 he was trying to raise money and get permission to excavate. 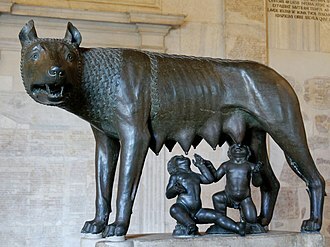 In the early 4th century BC (391 BC according to Varronian chronology) it was besieged by Gauls, and the Clusines called upon Rome to intermediate. However, in the following negotiations, one of the Roman delegates, of the gens Fabia, killed a Gallic leader. 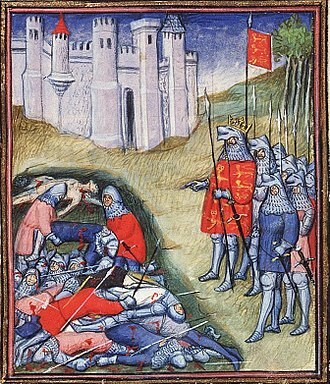 When the Romans refused to hand over the Fabii and in fact appointed two members of the family as consuls for the next year, the enraged Gauls broke up their siege and under the leadership of Brennus they marched onto and subsequently sacked Rome. ^ George Dennis (1848). The Cities and Cemeteries of Etruria. John Murray. pp. 327–. ^ Louise Adams Holland (1925). The Faliscans in prehistoric times. American Academy in Rome. ^ Luisa Banti (1973). Etruscan Cities and Their Culture. University of California Press. pp. 162–. ISBN 978-0-520-01910-2. ^ William M. Gaugler (January 2002). The Tomb of Lars Porsenna at Clusium and Its Religious and Political Implications. Laureate Press. ISBN 978-1-884528-25-5. ^ "Sotto Prato dorme una città etrusca"
Moving from the northern city-states of the Tuscanian Dodecapolis they swept into the Po valley through the Apennine passes. The Greek and Latin ancient writers tell us that an Etruscan expansion into Southern Italy, present day Campania region, the founder of these cities and of their League had been Ocnus, brother or son of Aulestes, according some authors, Tarchon according others. 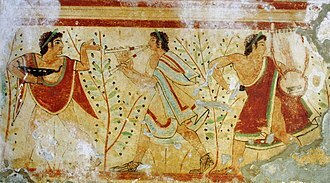 A First etruscan colonization, referred to the legendary Tarchon, can be traced to the early Iron Age and it was aimed to find new lands for agricultural uses, a Second colonization, dated to the mid-6th century BC, can be attributed to the as much legendary Ocnus. The latter colonization involved the reorganization of the entire Padanian region in order to increase its utility for the businesses and trades. During the 6th century BC Etruria experienced significant social, the protagonists of this process were people of the northern cities of Tuscany. The area around Bologna has been inhabited since the 9th century BC and this period, and up to the 6th century, is in fact generally referred to as villanovian, and had various nuclei of people spread out around this area. 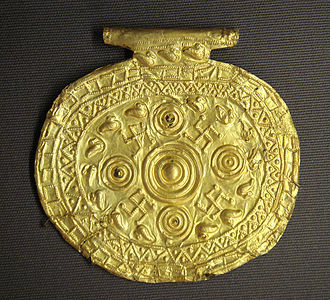 In the 7-6th centuries BC, Etruria began to have an influence on area. Traces of a 12th-9th century BC settlement, supposed of Villanovan origin, have found in Verucchio. Later it was an Etruscan possession, the current town derives its name from Vero Occhio, referring to its privileged position offering a wide panorama of the surrounding countryside and the Romagna coast. A settlement existed as early as around 2000 BC on the banks of the Mincio, in the 6th century BC it was an Etruscan village which, in Etruscan tradition, was re-founded by Ocnus. The name derives from the Etruscan god Mantus, of Hades, after being conquered by the Cenomani, a Gallic tribe, the city was conquered between the first and second Punic wars by the Romans, who attributed its name to Manto, a daughter of Tiresias. 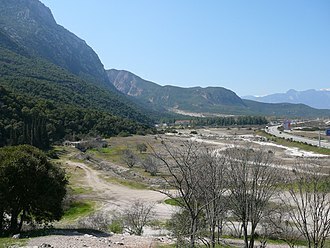 The new territory was populated by soldiers of Augustus. Mantuas most famous ancient citizen is the poet Publius Vergilius Maro, the first settlements built on the area are of Venetic origin, during the 12-9th century BC. Caelius Vibenna, (Etruscan Caile Vipina, was a noble Etruscan who lived c.750 BCE and brother of Aulus Vibenna. 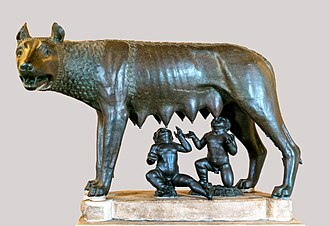 Upon arriving at Rome, Vibenna aided Romulus in his wars against Titus Tatius and he and his brother Aulus are recorded as having aided King Tarquinius Superbus, although Tarquinius Superbus lived some five generations after Romulus. Tacitus relates that a hill in Rome, previously named Querquetulanus was renamed the Caelian Hill after Caelius Vibenna. A burial urn inscribed Arnth Caule Vipina can be found at Deposito de Dei at Chiusi and it is likely that the ashes within belong to a different Etruscan of the same name. 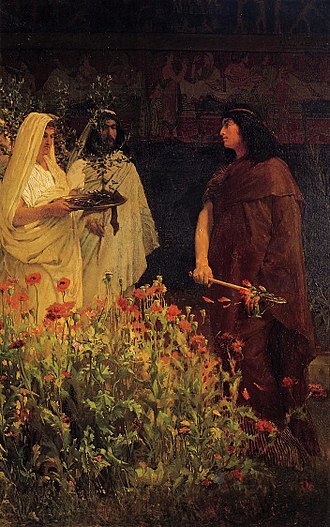 Caelius and Aulus Vibenna seem to have been well-known figures in Etruscan legend, Claudius, in a speech to the Senate referred to the adventures of Caelius Vibenna and his companion Mastarna, whom Claudius equates with Servius Tullius. Claudius claimed that Mastarna left Etruria with the remnants of Caelius army and occupied the Caelian Hill, the François Tomb at Vulci contains a scene showing Caelius and Aulus Vibenna taking part in one of these adventures. Lucius Tarquinius Priscus, or Tarquin the Elder, was the legendary fifth king of Rome from 616 to 579 BC. According to Livy, Tarquin came from Etruria, after inheriting his fathers entire fortune, Lucius attempted to gain a political office. Disgruntled with his opportunities in Etruria, he migrated to Rome with his wife Tanaquil, legend has it that on his arrival in Rome in a chariot, an eagle took his cap, flew away and returned it back upon his head. Tanaquil, who was skilled in prophecy, interpreted this as an omen of his future greatness, in Rome, he attained respect through his courtesy. 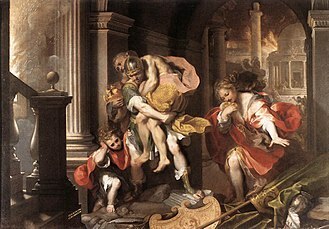 The king himself noticed Tarquinius and, by his will, appointed Tarquinius guardian of his own sons, upon the death of Marcius, Tarquin addressed the Comitia Curiata and convinced them that he should be elected king over Marcius natural sons, who were still only youths. In one tradition, the sons were away on an expedition at the time of their fathers death. According to Livy, Tarquin increased the number of the Senate by adding one hundred men from the leading minor families, among these was the family of the Octavii, from whom the first emperor, was descended. Tarquins first war was waged against the Latins, Tarquinius took the Latin town of Apiolae by storm and took great booty from there back to Rome. According to the Fasti Triumphales, this war must have occurred prior to 588 BC and his military ability was tested by an attack from the Sabines, who received auxiliaries from five Etruscan cities. Tarquin doubled the numbers of equites to help the war effort, the Sabines were defeated after difficult street fighting in the city of Rome. In the peace negotiations followed, Tarquin received the town of Collatia. Tarquin returned to Rome and celebrated a triumph on September 13,585 BC, the Latin cities of Corniculum, old Ficulea, Crustumerium, Ameriola and Nomentum were subdued and became Roman. Since Tarquin had kept the captured Etruscan auxiliaries prisoners for meddling in the war with the Sabines, seven other Etruscan cities joined forces with them. 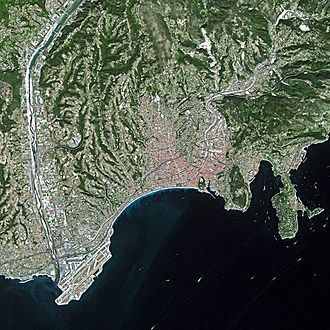 The Etruscans soon captured the Roman colony at Fidenae, which became the focal point of the war. Chiusi is a town and comune in province of Siena, Italy. Clusium was one of the powerful cities in the Etruscan League. Chiusi came under the influence of Rome in the 3rd century BC and was involved in the Social War, in 540 AD it was occupied by the Ostrogoths and was seat of a Lombard duchy. The lowlands around Chiusi house numerous trove of tombs for this civilization, the Etruscan Museum of Chiusi is one of the most important repositories of Etruscan remains in Italy. Other sights include, The Romanesque Cathedral of San Secondiano, built around 560 AD over a pre-existing basilica and it has a nave and two aisles supported by antique columns. The Sacrament Chapel houses a Nativity and Saints by Bernardino Fugai and it has a separated bell tower which was turned into a defence tower in 1585. Under the tower is a Roman swim pool dating from the 1st century BC, the so-called Labyrinth of Porsenna, a series of tunnels under the town, built in the 6th-5th century BC and probably utilized in Etruscan-Roman times for drainage of rain waters. Cumae was an ancient city of Magna Graecia on the coast of the Tyrrhenian Sea. Founded by settlers from Euboea in the 8th century BC, Cumae was the first Greek colony on the mainland of Italy, the ruins of the city lie near the modern village of Cuma, a frazione of the comune Bacoli in the Province of Naples, Italy. Cumae is perhaps most famous as the seat of the Cumaean Sibyl and her sanctuary is now open to the public. In Roman mythology, there is an entrance to the underworld located at Avernus, a lake near Cumae. They were already established at Pithecusae, they were led by the paired oecists Megasthenes of Chalcis and its name refers to the peninsula of Cyme in Euboea. It spread its influence throughout the area over the 7th and 6th centuries BC, gaining sway over Puteoli and Misenum and, all these facts were recalled long afterwards, Cumaes first brief contemporary mention in written history is in Thucydides. The growing power of the Cumaean Greeks led many indigenous tribes of the region to organize against them, notably the Dauni, contact between the Romans and the Cumaeans is recorded during the reign of Aristodemus. 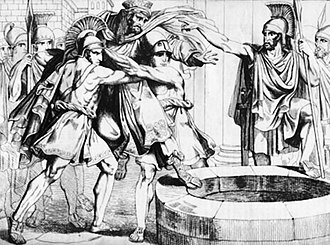 Livy states that prior to the war between Rome and Clusium, the Roman senate sent agents to Cumae to purchase grain in anticipation of a siege of Rome. Also Lucius Tarquinius Superbus, the last legendary King of Rome, lived his life in exile with Aristodemus at Cumae after the Battle of Lake Regillus, during the reign of Aristodemus, the Cumaean army assisted the Latin city of Aricia to defeat the Etruscan forces of Clusium. The combined fleets of Cumae and Syracuse defeated the Etruscans at the Battle of Cumae in 474 BC, the Greek period at Cumae came to an end in 421 BC, when the Oscans broke down the walls and took the city, ravaging the countryside. Cumae came under Roman rule with Capua and in 338 was granted partial citizenship, in the Second Punic War, in spite of temptations to revolt from Roman authority, Cumae withstood Hannibals siege, under the leadership of Tib. At the end of the 4th century, the temple of Zeus at Cumae was transformed into a Christian basilica, the first historically documented bishop of Cumae was Adeodatus, a member of a synod convoked by Pope Hilarius in Rome in 465. The Temple of Zeus at Cumae was converted into a paleochristian basilica. The baptismal font can still be seen in the back of the building. Statue of Quintus Fabius Maximus Verrucosus, made between 1773–1780 for Schönbrunn Palace, Vienna. 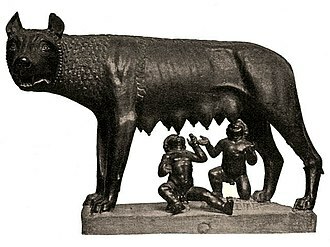 The Capitoline Wolf with Romulus and Remus. 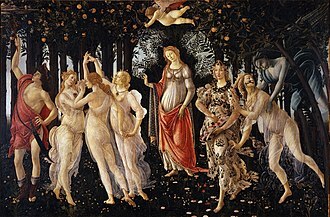 One legend holds that their respective followers were called the Quinctilii and the Fabii. Denarius of Gaius Fabius Hadrianus, 102 BC. On the obverse is the head of Cybele, a possible allusion to the visit to Rome of Battaces, a priest of Magna Mater. The reverse depicts Victoria driving a biga, with a flamingo below. Denarius of Numerius Fabius Pictor, 126 BC. On the obverse is the head of Roma; on the reverse is Quintus Fabius Pictor, the praetor of 189, holding an apex and shield inscribed QVIRIN, alluding to his status of Flamen Quirinalis. Lars Porsena from the Promptuarii Iconum Insigniorum. 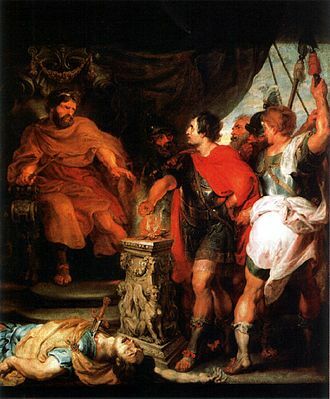 Mucius Scaevola before Porsenna (1620s) by Rubens and van Dyck. A rendering of Tanaquil, wife of Tarquinius Priscus, fifth king of Rome.